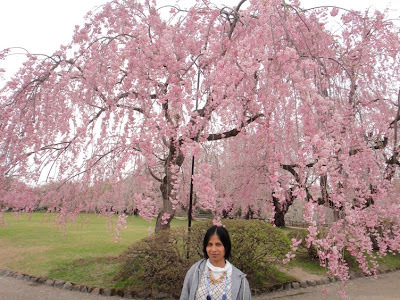 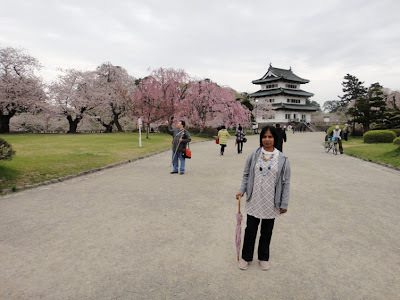 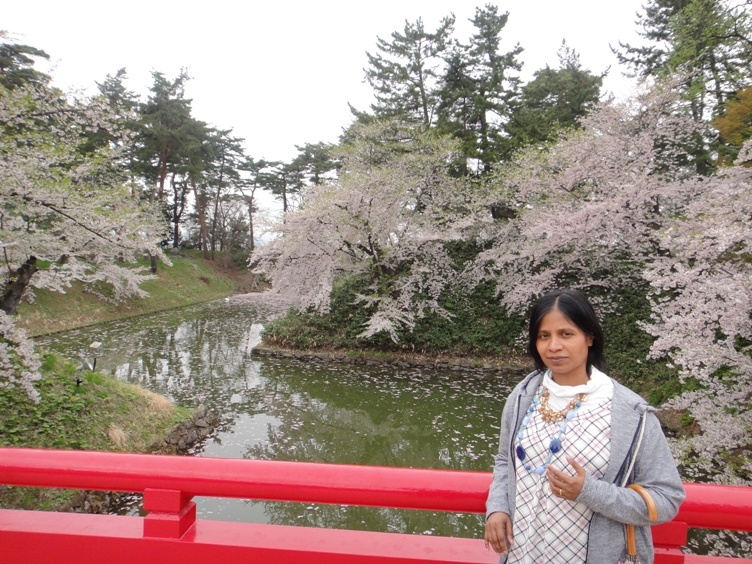 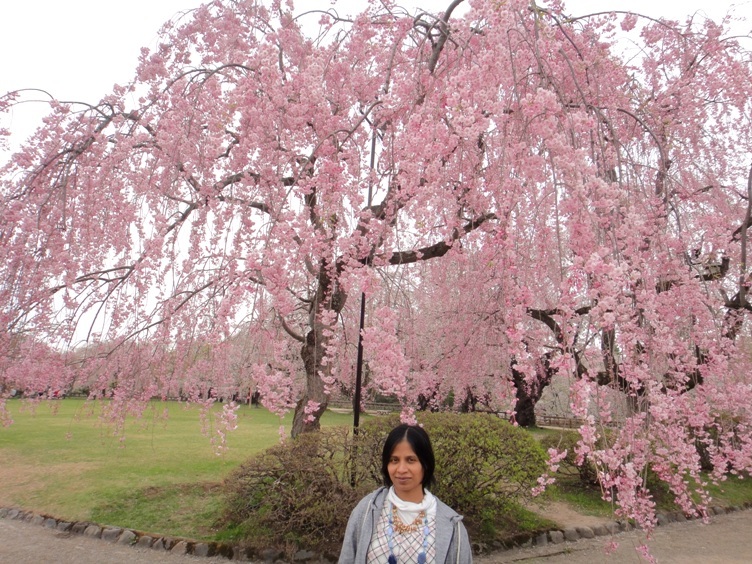 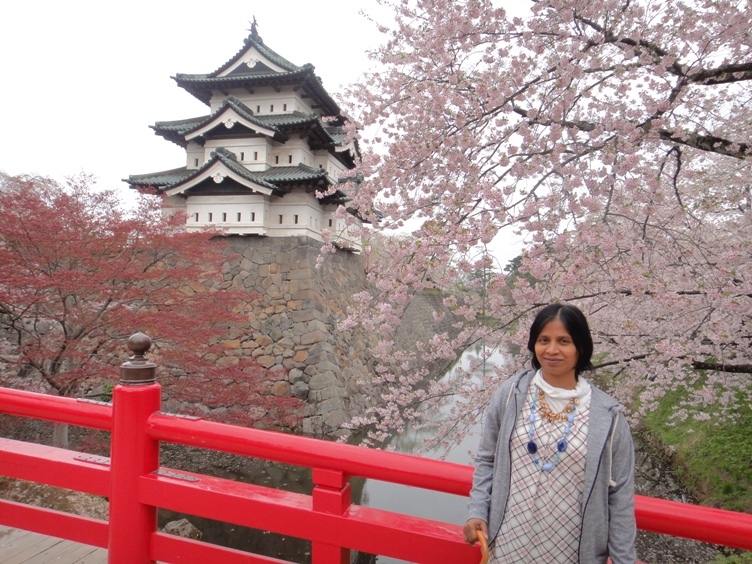 On May 11th, hubby and I went to cherry blossom festival (Hanami) at Hirosaki Castle Park in Hirosaki City of Aomori prefecture. 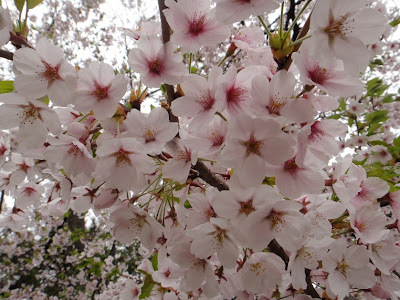 Hanami is a traditional Japanese custom of viewing and enjoying the beauty of flowers, usually cherry blossoms (Sakura) or Japanese plum blossoms (Ume). 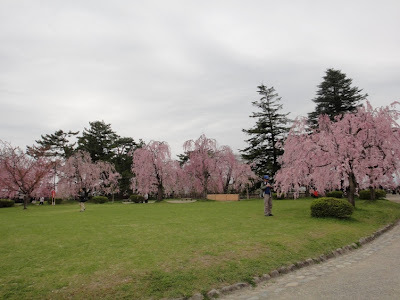 Hirosaki Castle Park is one of the top three cherry blossom viewing spots in Japan along with Takato Castle in Ina City of Nagano prefecture and Mount Yoshino in Nara Prefecture. 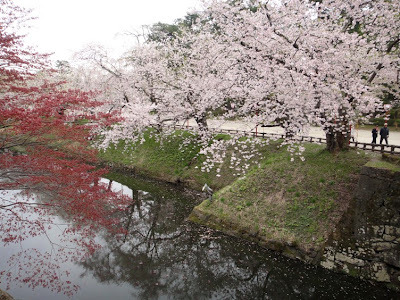 Hirosaki Castle Park is located at the site of the ruins of Hirosaki Castle. The castle was constructed in 1611, and housed several generations of lords of Tsugaru clan. 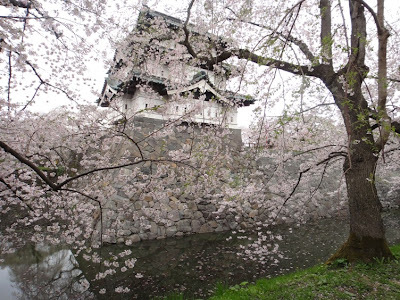 The castle is surrounded by three moats, and the remains of the castle include five castle gates, three corner turrets, and the main tower. The original five-storied main tower was struck by lightning and burned down in 1627. 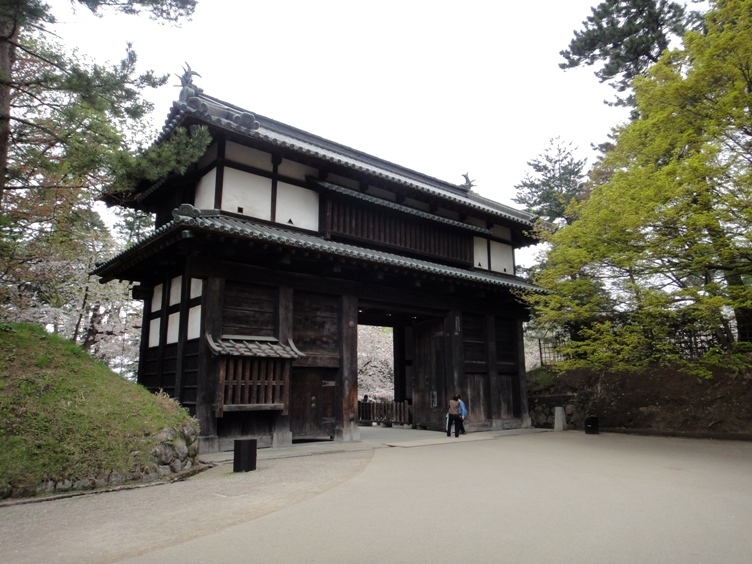 It was then replaced by the current three-storied structure in 1811. 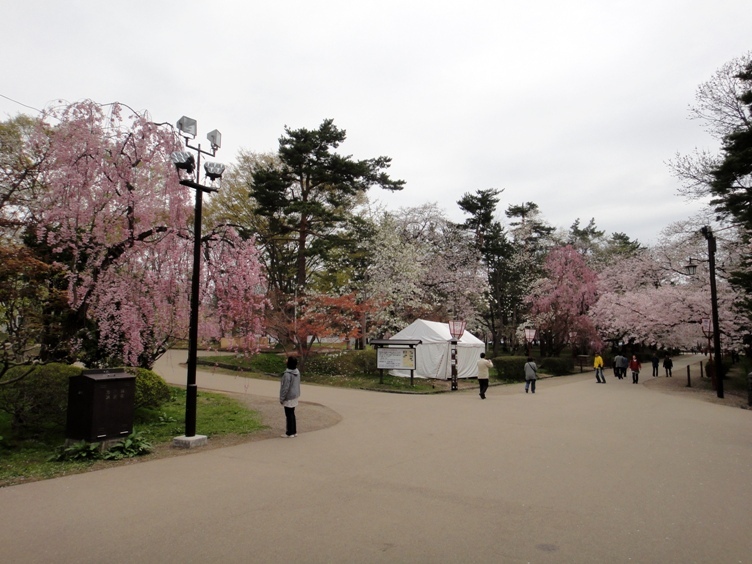 The castle grounds are now a public park. 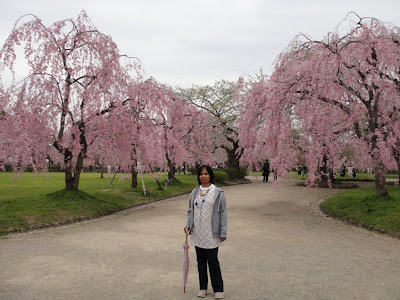 Hubby and I had visited the park in July 2009, about which I have written earlier. 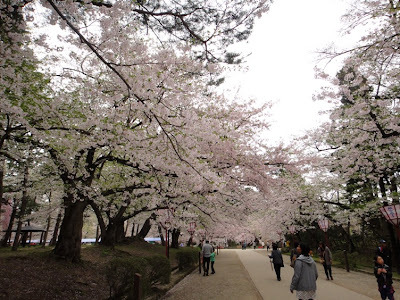 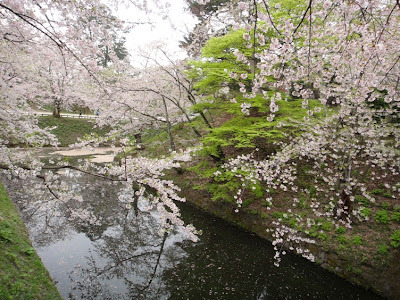 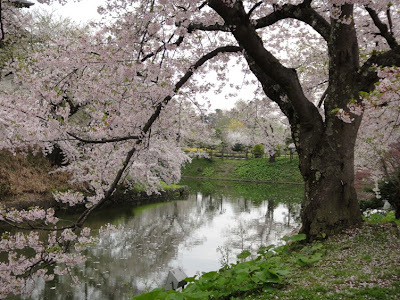 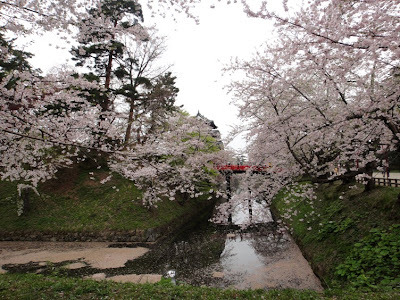 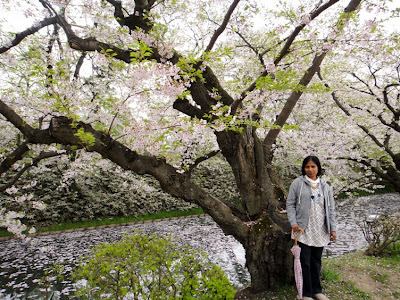 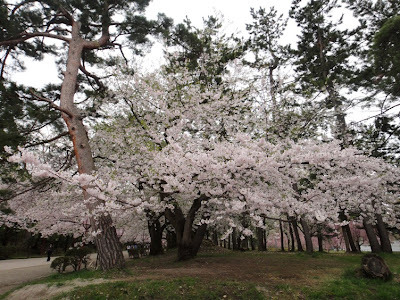 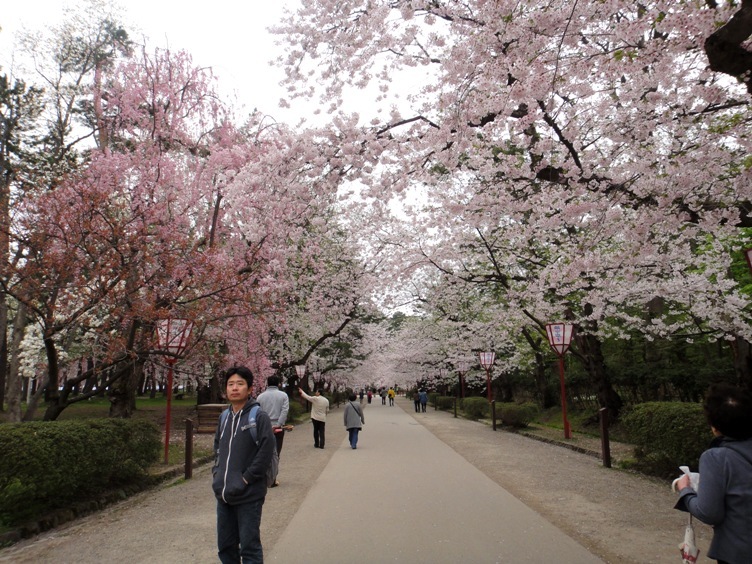 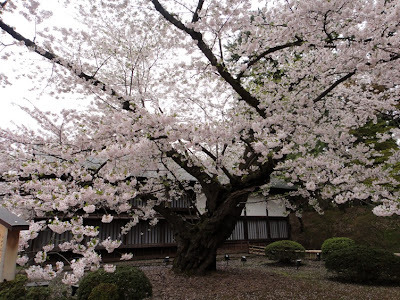 Hirosaki Castle Park is famous as one of the best cherry blossom viewing spots in Japan. The park has about 2600 Sakura trees of 50 different varieties, which were originally planted around in the grounds in 1903. Over a million people visit the park during the cherry blossom festival season. Cherry blossom usually blooms from end of April to mid May at this park. On May 11th, hubby and I started from our home at 7.30 in the morning and it took us almost 4 hours of car drive to reach Hirosaki City. 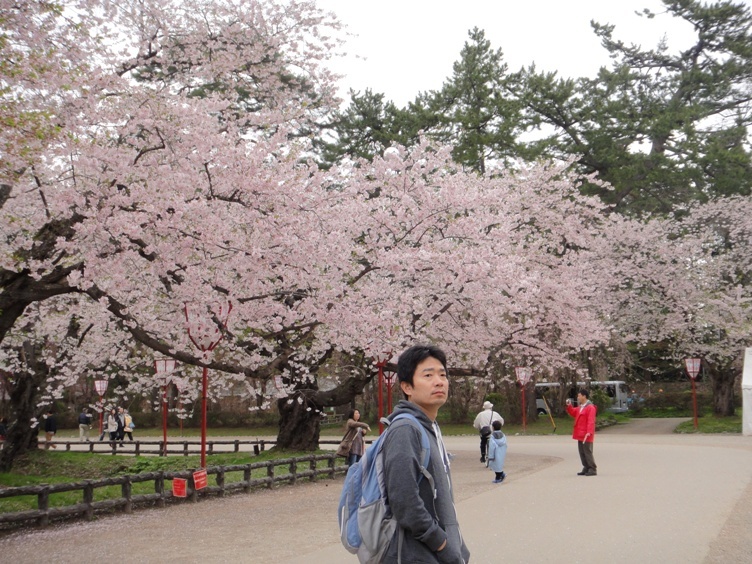 We parked our car at a parking area located in Otemon Square. The square is designed as a stepping off point for visitors to Hirosaki and is a focal point of culture and tourism in the city. 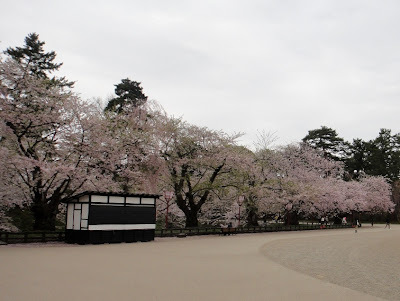 Otemon Square stands across the main entrance gate of Hirosaki Castle, and was named after the main gate of the castle. 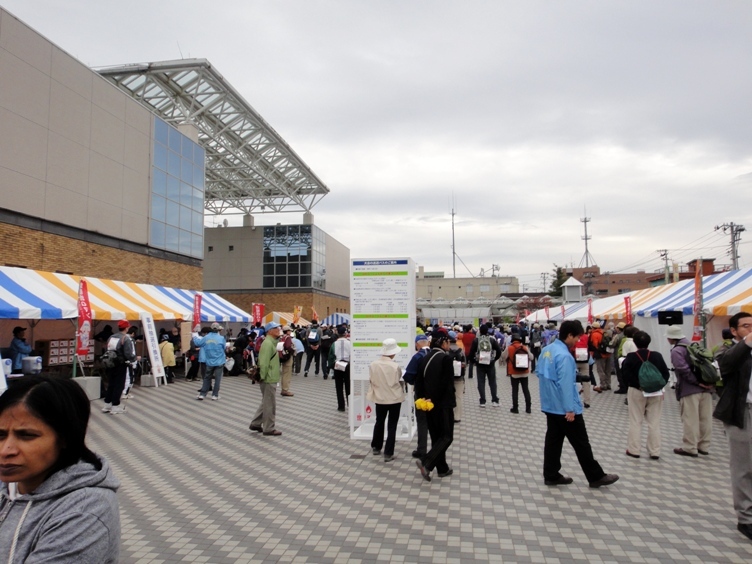 We noted that a festival was going on at the square and there were many people enjoying some songs. 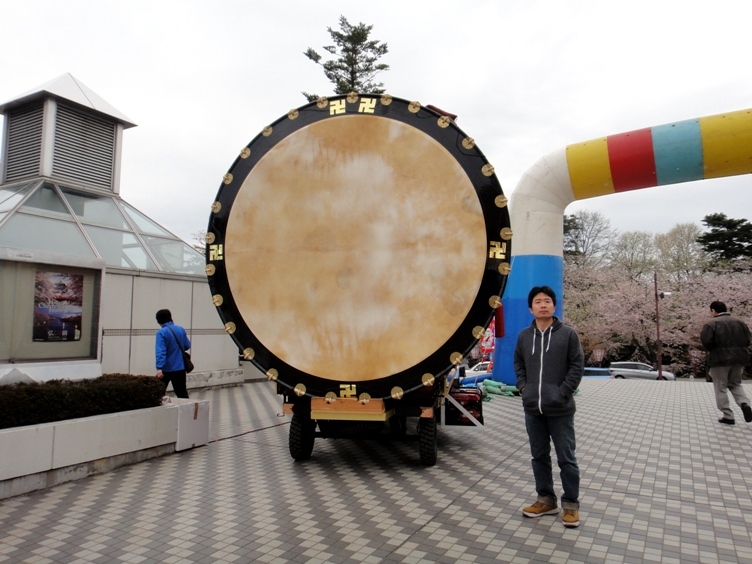 We also saw a huge drum named Tsugaru Joppari Taiko exhibited at the square. 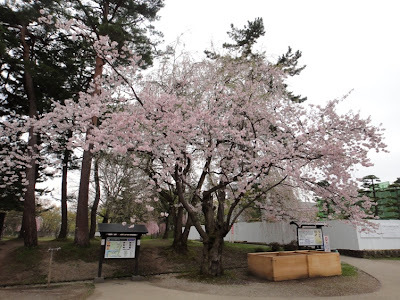 Hubby and I walked towards Hirosaki Castle Park and saw several varieties of Sakura trees in full bloom along the outer moat surrounding the castle. Some of the Sakura varieties were at an advanced stage of blooming and the moat was filled with Sakura petals. 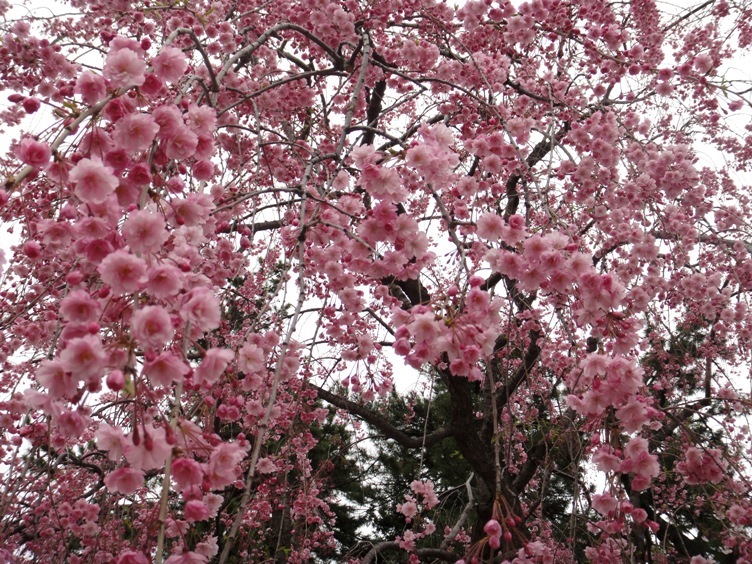 It was a beautiful sight to behold. 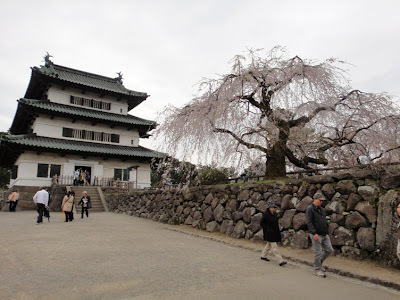 After about five minutes of walking we reached Otemon Main Gate of the castle. 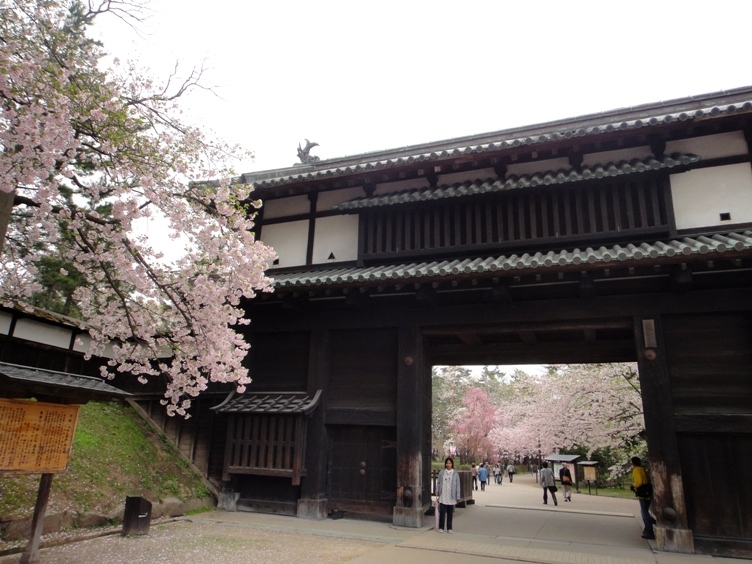 The gate was also surrounded by blooming cherry blossom. 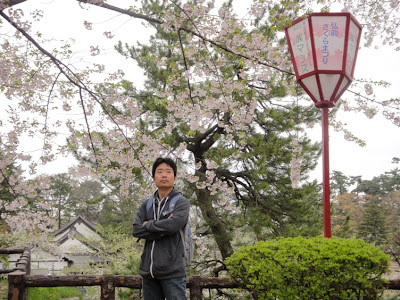 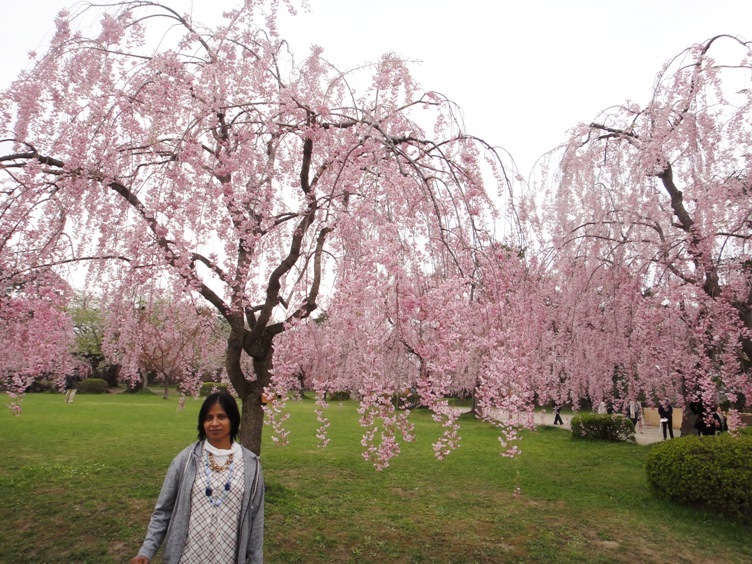 I am standing next to a Sakura tree that was at an advanced stage of blooming. 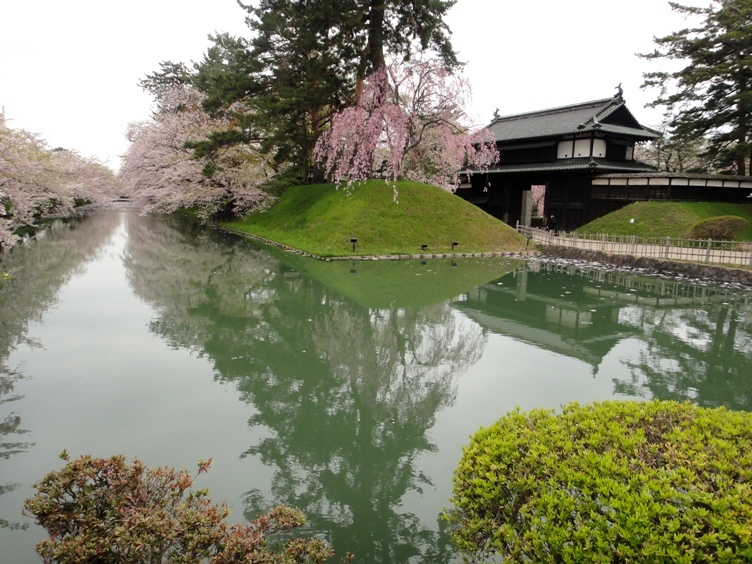 Note that the moat is filled with Sakura petals. 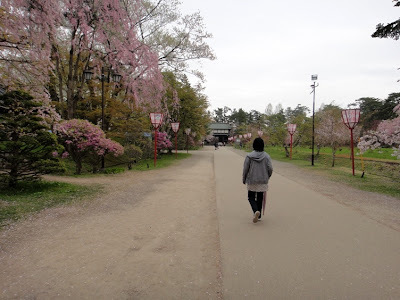 After entering the main gate of the castle, we walked along a paved pathway that was surrounded by many varieties of fully bloomed Sakura trees on both sides of the path. 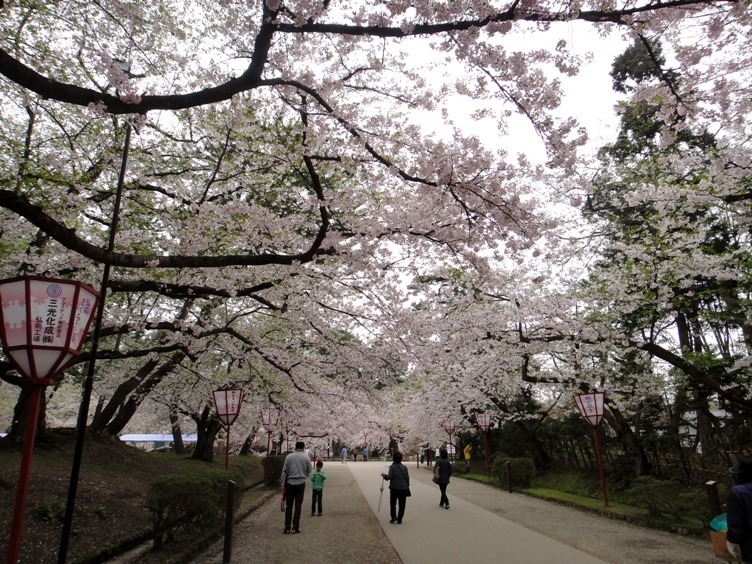 It felt as if we were walking through a Sakura tunnel. It was a wonderful and memorable experience. 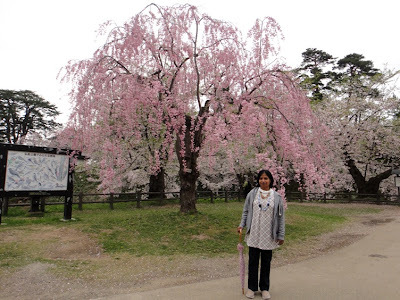 While walking we noted that many of the trees were very old and such trees in full bloom looked so majestic. After walking for about ten minutes on this pathway, we started seeing a red lacquered wooden bridge named Sugino Ohashi. This bridge was over the middle moat of the castle. 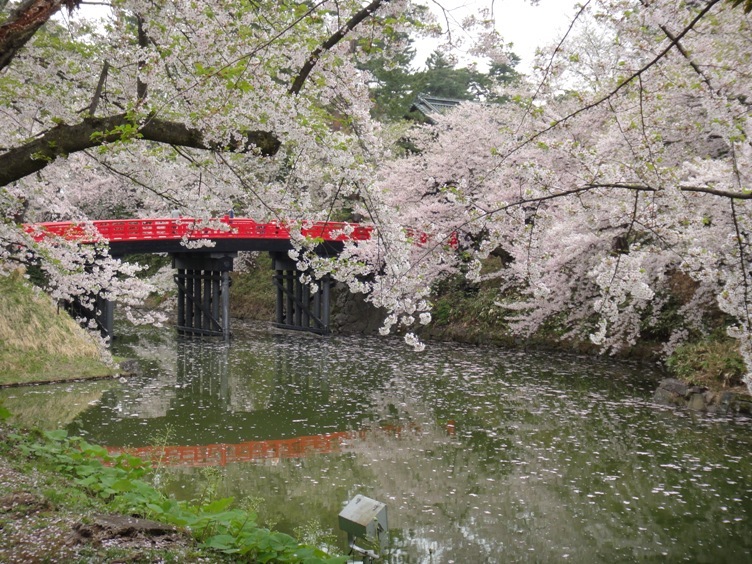 The blooming Sakura trees, the red bridge, and the petal filled moat made for a superb view. I felt that it was one of the most beautiful and breathtaking spots at this park. 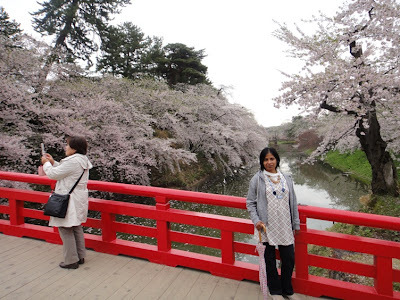 Standing on the red colored Sugino Ohashi Bridge and viewing various varieties of blooming Sakura trees along the middle moat was a fantastic experience. I spent several minutes standing on the bridge and just taking in all the views surrounding us. I noted that various varieties of Sakura trees along the moat were at various stages of blooming. 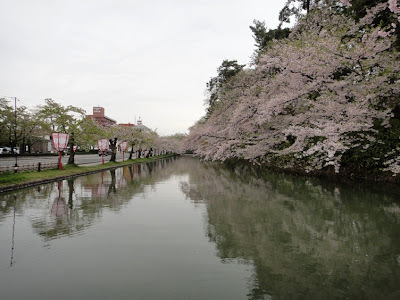 I am standing on the right side of the bridge. Blooming Sakura trees along the middle moat look superb. 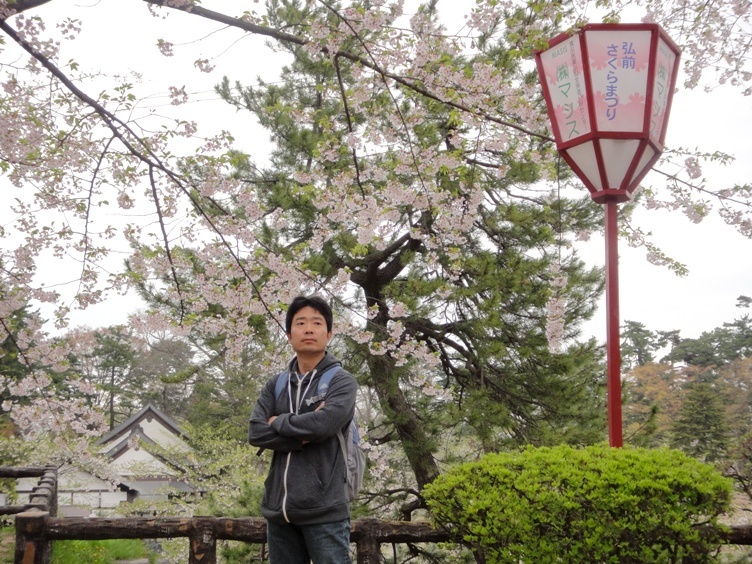 I am standing on the left side of the bridge. Blooming Sakura trees along the moat look wonderful. 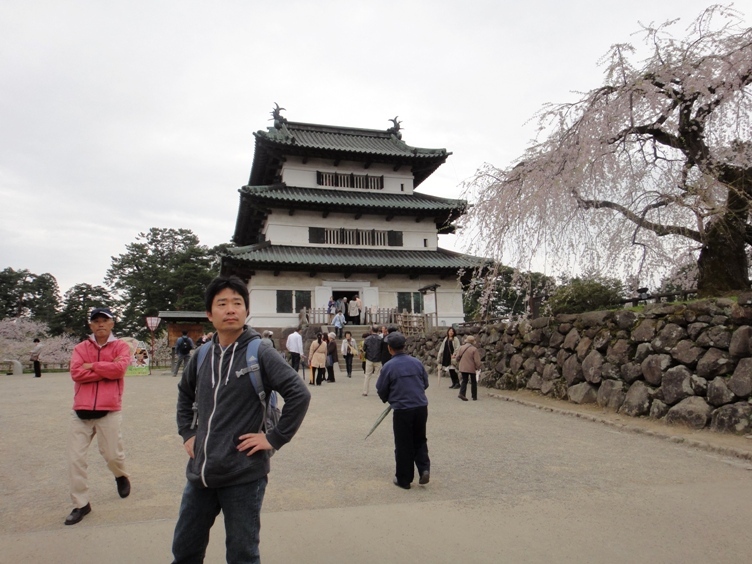 After walking for a few more minutes, we reached another castle gate named Minami Uchimon. Crossing this gate, we saw that the park ground was full of blooming Sakura trees of various varieties. 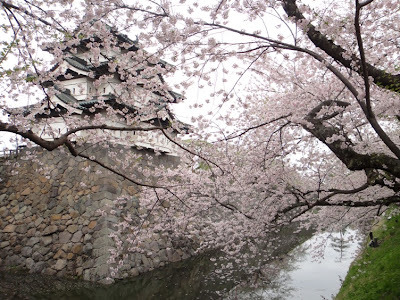 After a leisurely walk along the paved pathway for another 15 minutes, we started seeing the inner moat, a bridge called Gejobashi over the moat, and the castle main tower. The combination of the blooming Sakura trees along the moat, the bright red bridge, the petal filled moat, and the fabulous tower made for a perfect and spectacularly beautiful view. 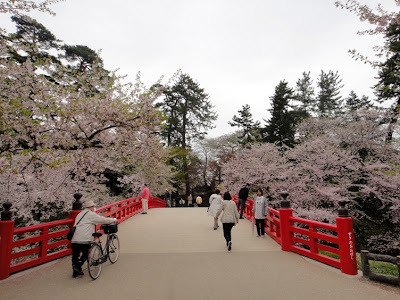 Instead of crossing the bridge, we continued our walk along the paved pathway for another 100 meters, and enjoyed viewing the main tower surrounded by blooming Sakura trees from various positions and angles. Afterwards we turned around and walked back about 100 meters along the paved pathway, and walked up to the bright red Gejobashi Bridge. Standing on the bridge, and viewing the inner moat and the castle tower surrounded by various varieties of blooming Sakura trees was a wonderful experience. 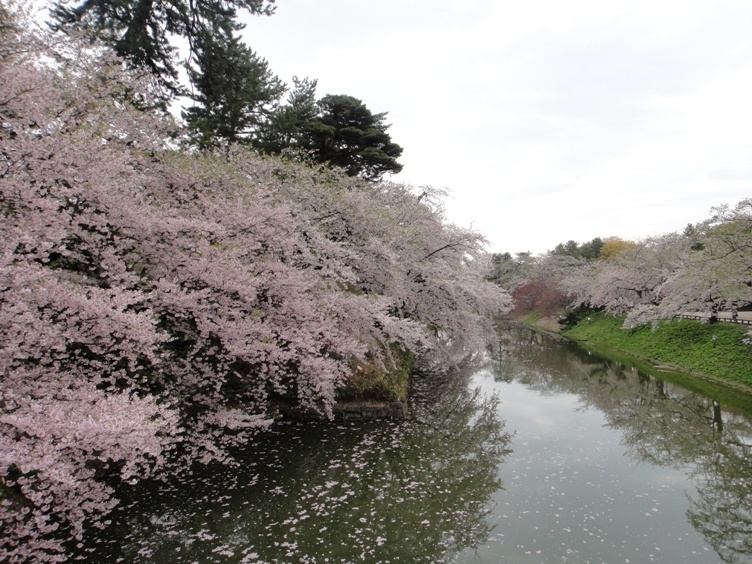 I spent several minutes standing on the bridge and enjoying the views. I am standing towards the right side on Gejobashi Bridge over the inner moat. 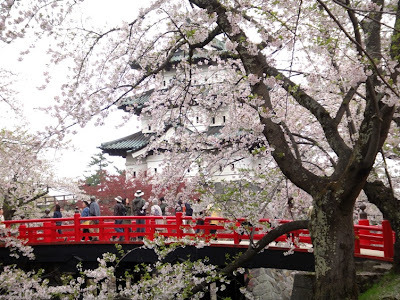 The castle main tower and blooming Sakura trees are seen in the background. 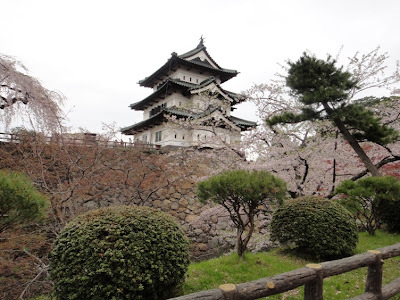 After crossing Gejobashi Bridge, we were near the castle main tower. This three storied tower is the only one in Tohoku region that was not rebuilt in the present modern era. This tower surrounded by blooming Sakura trees made for a gorgeous view. 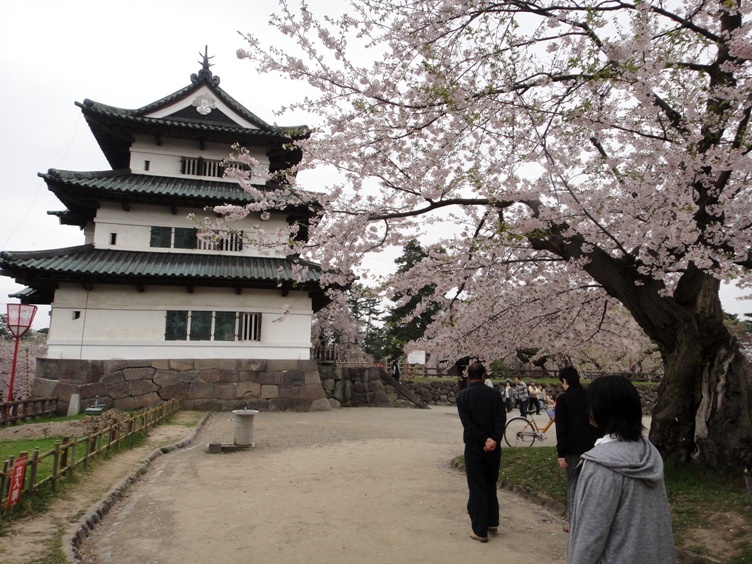 We took several photos of the tower from various positions and angles. 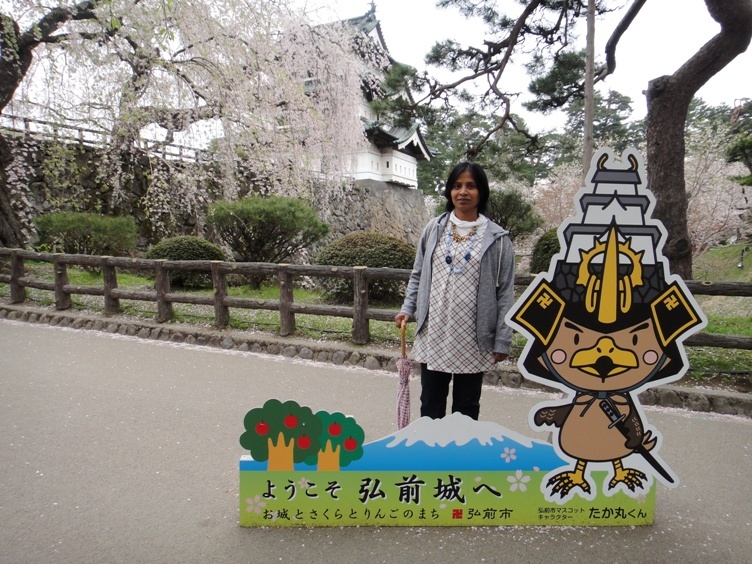 I am standing next to the cutout of the mascot character named Takamaru-kun of Hirosaki City. 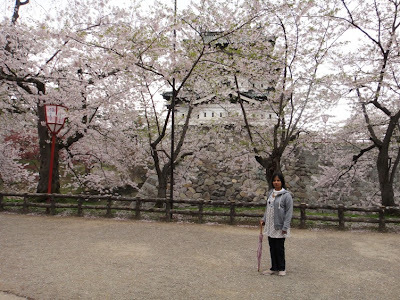 The castle tower is seen in the background. Afterwards we walked towards the north of the castle main tower in the park, and reached a garden full of blooming Sakura trees of many varieties. 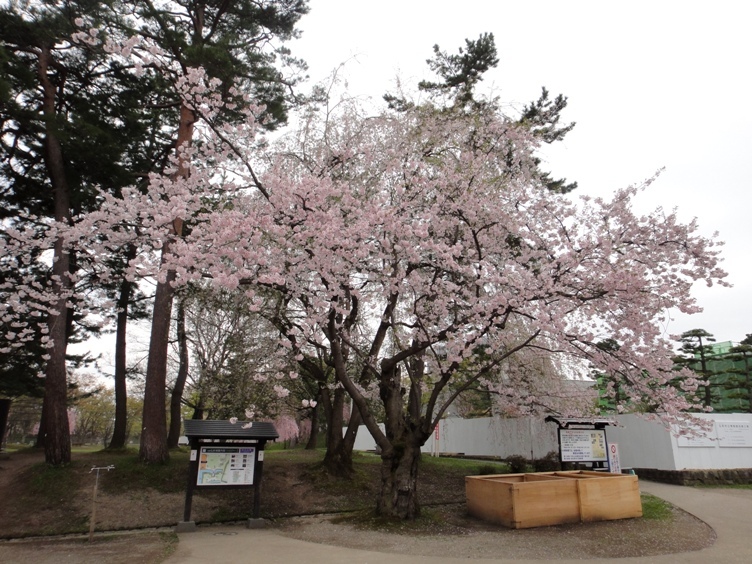 We got a wonderful close up view of the blooming Sakura that surrounded us. 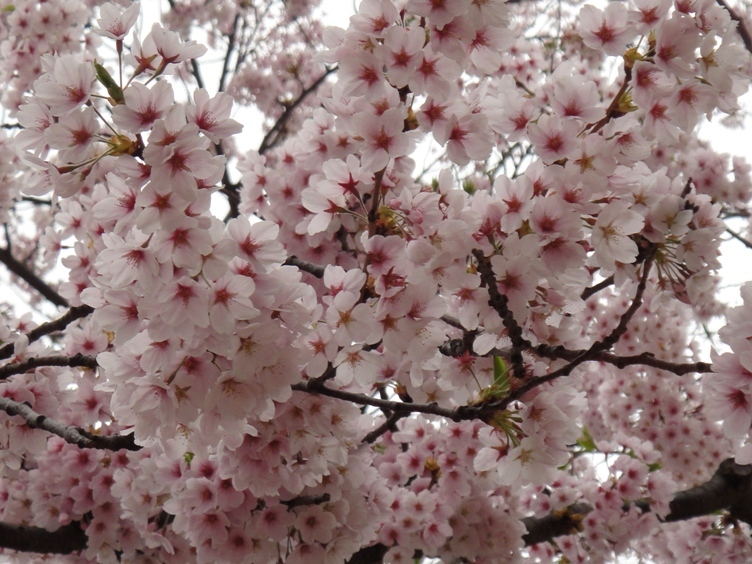 It was simply superb. 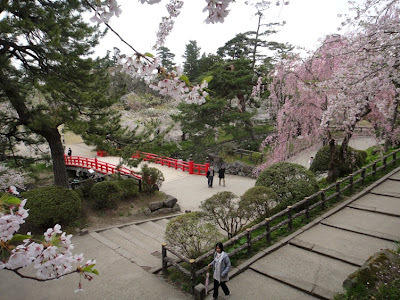 There were several pleasant picnic areas at this garden. 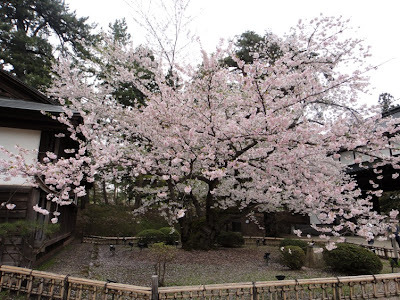 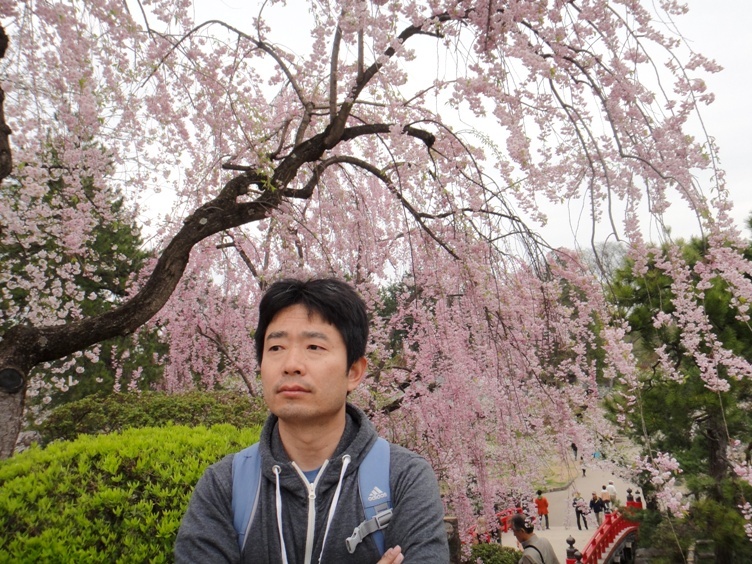 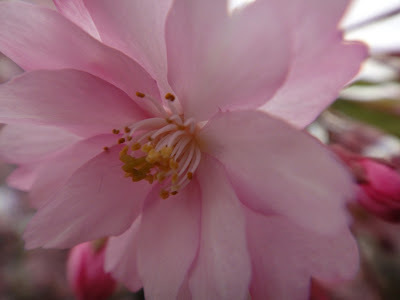 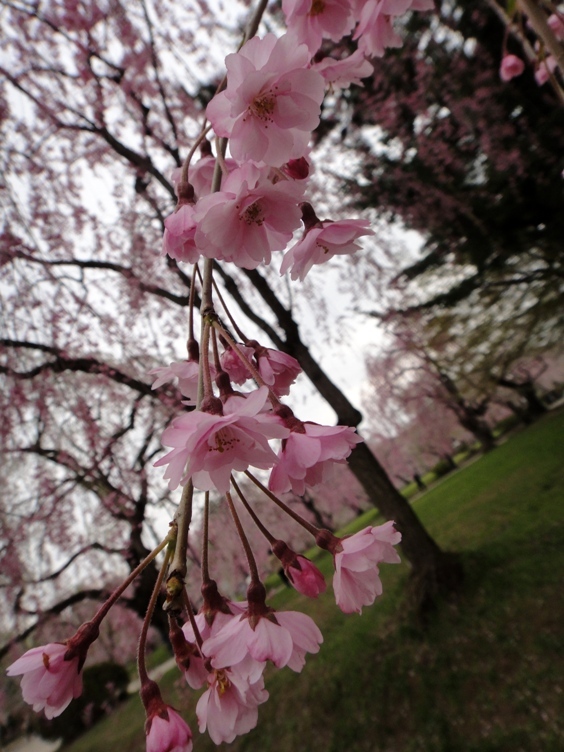 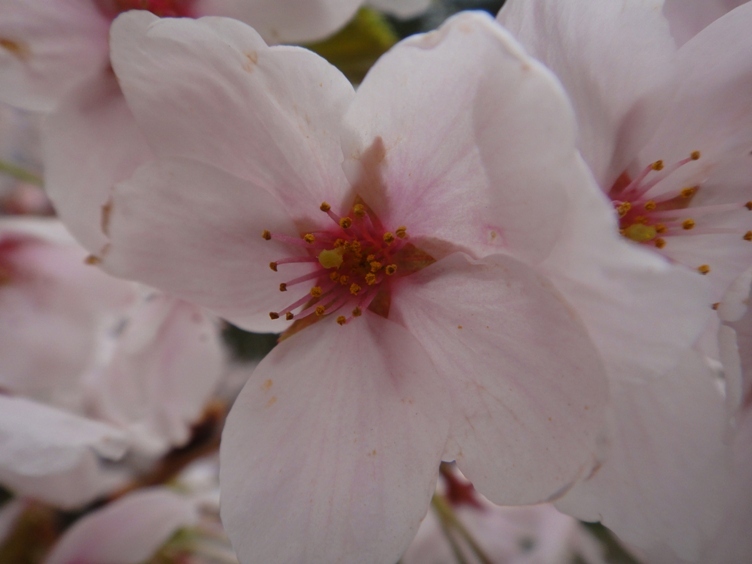 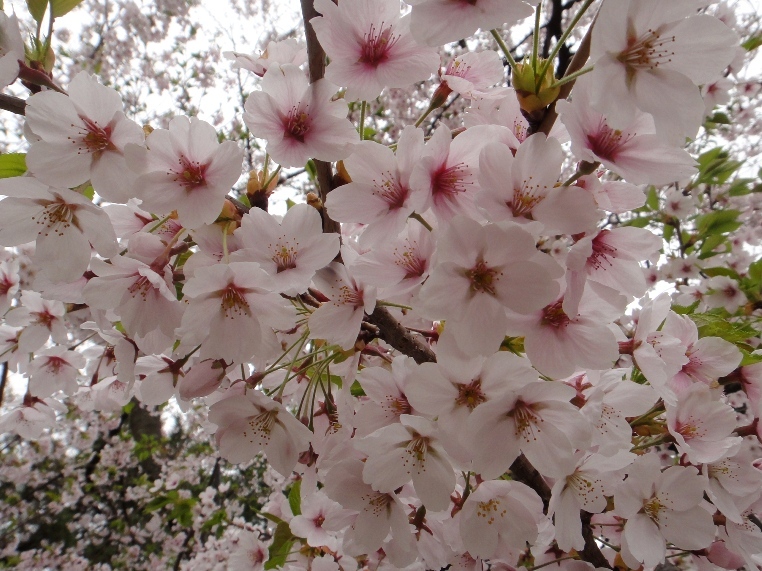 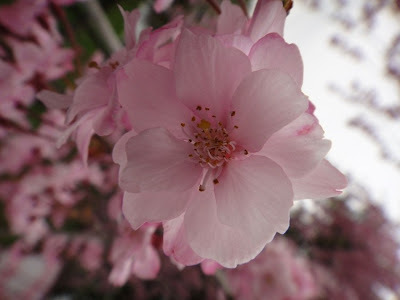 We took many photos of the blooming Sakura and their close up views. I am standing in the garden with many blooming Sakura trees in the background. The castle main tower as viewed from the northwest looks so grand. After enjoying viewing various varieties of blooming Sakura in the garden, we started walking back towards the castle main tower. 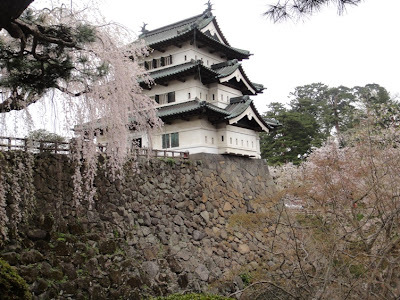 The castle tower is located on a slightly elevated ground. 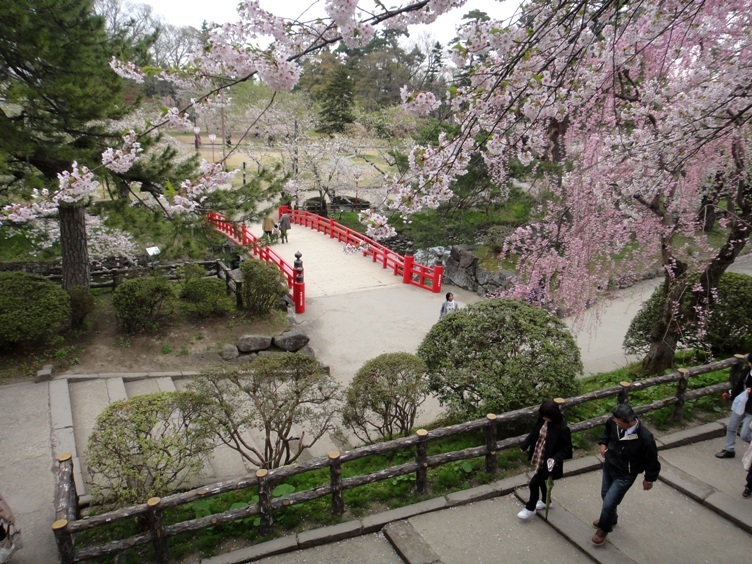 From the northeast side of the castle tower, we looked down and got a magnificent view of Gejobashi Bridge, several steps leading to the bridge, and blooming Sakura trees all around. It was such a perfect and pleasant view. While walking back, we got a beautiful view of the castle main tower from the north. 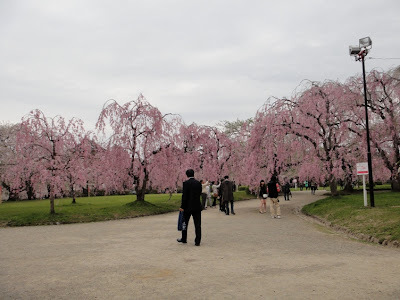 After enjoying viewing various kinds of blooming Sakura trees, we started walking back towards one of the gates of the castle park. 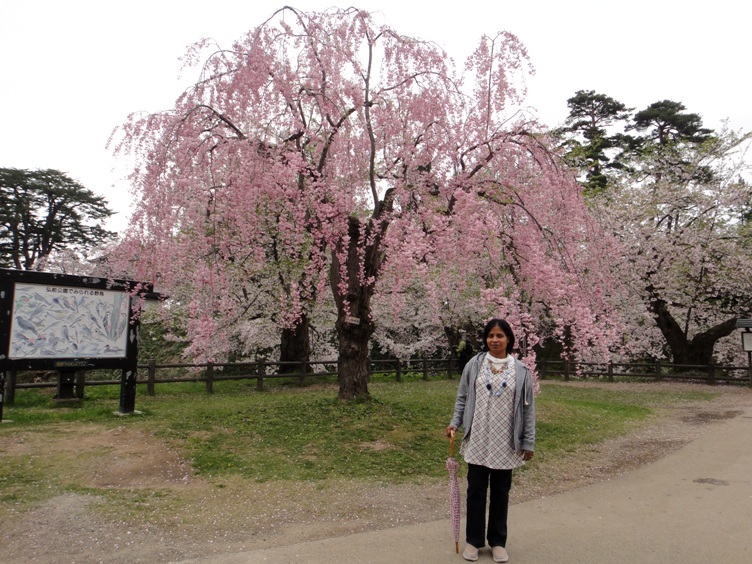 On our way, we saw a 130 year old Sakura tree of a variety named Somei Yoshino in full bloom. It is said to be the oldest existing tree among this species in Japan, and has the thickest trunk. 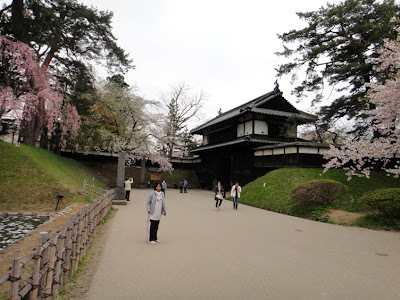 We walked for about 15 minutes and reached the castle gate from where we exited the grounds of the castle park. Afterwards we had lunch at a restaurant in one of the buildings in Otemon Square. 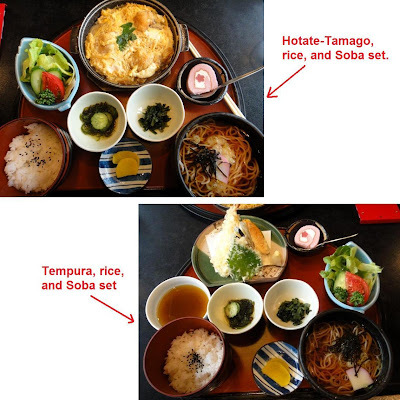 Hubby ordered a set lunch consisting of Hotate-Tamago (scallop-egg), rice, and Soba noodles. 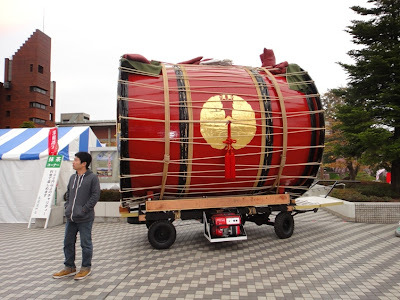 This is because Hirosaki is a major production center of scallops. I order a set lunch of Tempura, rice, and soba noodles. 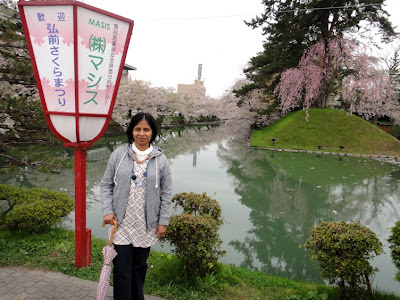 We shared our lunch which was delicious and very filling. We loved the cherry blossom festival in Hirosaki Castle Park. 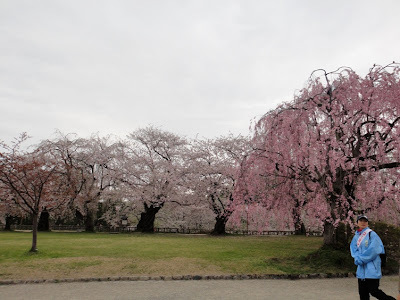 With about 2600 blooming Sakura trees of about 50 varieties in the huge park, it felt like viewing multiple cherry blossom spots combined into a single one. Wonderful blog. Love your sense of adventure and balance both of which come through in your post. Gorgeous! 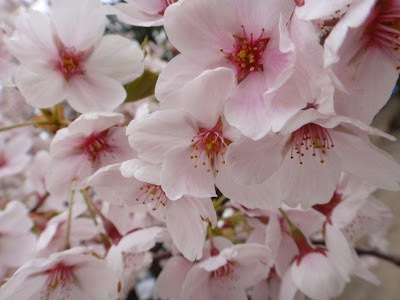 Such lovely flowers, aren't they? 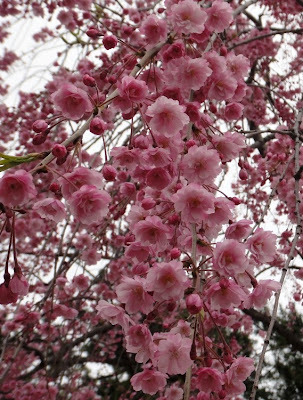 Last year, I'd been to the Japanese Tea Gardens in San Francisco just to see cherry blossoms.